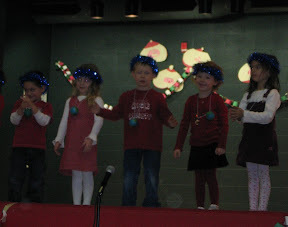 This morning was the Kindergarten Christmas concert. 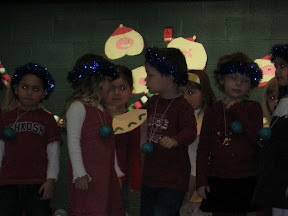 There were four classes (two senior and two junior) up singing. 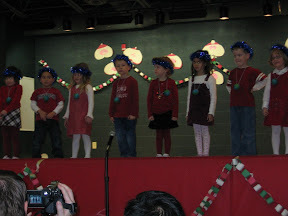 They each did a couple of songs. BigE's class was up first. 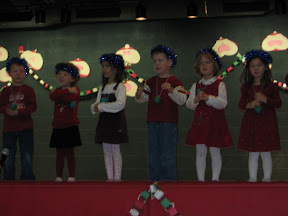 They sang "It's a Small World" which is what that thing hanging around their neck is. It's a little Styrofoam world covered in blue and green tissue paper. Here's a dump of the pictures. The picture quality isn't the best. Even for a gym with our camera. Not sure why though. I have a few video's that I'm uploading so stay tuned.